Those of you who run every day as part of an aerobic workout program could cause damage to your lower back, no matter your age. Some of you may think only older runners are typically susceptible. Evidence shows even younger runners can place stress on their lower back and create considerable long-term pain. The good news is that with proper stretching, you can alleviate this and bring pain management. First, though, you'll want to know why running sometimes causes lower back issues. The symptoms aren't always immediately obvious. Proper diagnosis should also become top of mind. Using proper lower back stretches, you can avoid this happening again. What Typically Causes Lower Back Pain in Runners? Repetitive movements are the main cause of lower back pain in runners. Any kind of aerobic exercise involving repetitive movement is going to place a strain on muscles and joints. Pain frequently happens from aggravating the vertebrae in your back due to running intensely. This is why many runners need to take several-day breaks while training to avoid making these conditions worse. Your sacroiliac joints can also be to blame if they aren't moving well as you run. Over time, strain in this area could place more wear and tear on your lower back. How you position your body as you run won't really prevent these back issues from occurring. What's most important is to learn some stretching exercises you can do before you run and after. However, before you start any stretching, it's a good idea to consult your doctor and learn about three different types of lower back pain most athletes face. What Are the Three Most Common Types of Back Pain? The first type seen the most often is muscular. Tearing muscles in your back can at least heal over time, despite taking sometimes weeks. Stretching will do much to prevent muscle pain because you'll be warming up your muscles enough to prevent any pulls. Bone-related lower back pain is just as typical with those who run often. This occurs with damaged vertebrae mentioned above, plus other bones near the spine. Arthritis is another culprit. While you may think only older people get arthritis, it can happen to younger people as well when partaking in excessive back strain. Discogenic back pain is the other type of lower back issue many runners face. You'll find this occurring if you have a bulging or slipped disc. It may require surgery eventually, but it's possible to relieve pain with the right stretching techniques. What Are the Most Typical Symptoms of Lower Back Pain? Numerous back pain symptoms can start to occur as you train as a runner. These pains may start with a dull ache after several running sessions. For muscle-related back pain, this might begin as pain on the side or lower part of your spine. Muscle spasms are fairly typical in this scenario. Mild to severe aches in the lower back start to happen with bone-related back issues. Arthritis causes chronic pain that grows worse as you do more running and age. With discogenic pain, general symptoms involve feeling sharp pains when you bend over. This pain typically shoots down your legs, making it more difficult to do running or other physical activities. Try the Child Pose where you place your hands and knees on the floor (or gym mat) while keeping your hands under your shoulders and knees. Slowly stretch forward with your arms as you place your palms flat on the mat. Lower your hips toward your heels as you drop your head and chest downward. It's recommended you hold this position for 20 to 30 seconds during each stretch. It is also fairly simple, though you should do this and other stretches at a slow pace as a beginner. Lie down on your back (again using a mat), then bend your knees to the side. Extend your arms out to a 'T' position and hold this position for 20 to 30 seconds. Be sure to keep your feet flat while bending your legs and knees. Do the same stretch position while bending your legs to the other side. Also, try the Knee to Chest stretch where you lie flat on your back and slowly bring each knee up to your chest while holding for 20-30 seconds. You can use your arms to help guide each knee forward to make it easier. Just go slowly so you don't sprain a muscle. Doing this stretch will align your pelvis and strengthen the muscles in your lower back over time. 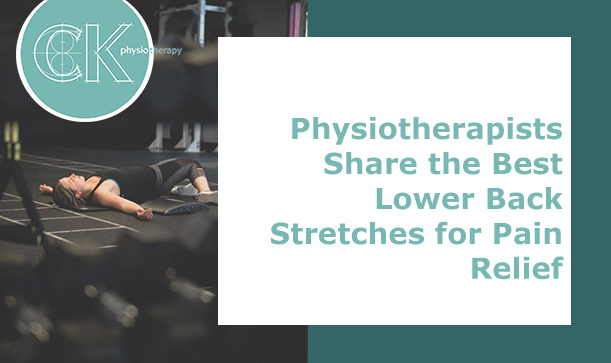 Keep in mind that whilst you can do these stretches on your own, it's highly recommended you go to a physiotherapist to find out which stretches work the best for your lifestyle. They'll help tailor these approaches to your specific needs and base it on your lower back pain diagnosis. At CK Physio, we're available to help you find the best holistic treatments for lower back pain due to running. Those of you who live in the Ealing area are going to find it beneficial using holistic treatments for your pain rather than relying on addictive pain medications with side effects. Our approach comes in properly diagnosing what kind of back pain you have and which stretches work the best to control your pain. We'll help you discover how natural methods of pain management are the healthiest ways to keep yourself feeling good as you continue your daily runs. Now you can train for a local marathon without worrying how it'll wreak havoc on your back. Contact us to find out more about our physiotherapy approaches.